Flow cytometric analysis of HeLa cells, untreated (blue) or treated with Tunicamycin #12819 (2 μg/ml, 8 hr; green), using CHOP (L63F7) Mouse mAb (Alexa Fluor® 647 Conjugate) (solid lines) or concentration-matched Mouse (MOPC-21) mAb IgG1 Isotype Control (Alexa Fluor® 647 Conjugate) #4843 (dashed lines). 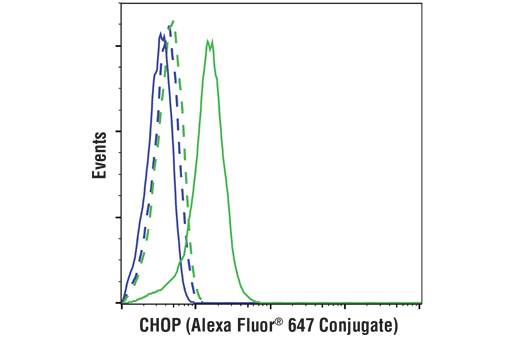 CHOP (L63F7) Mouse mAb (Alexa Fluor® 647 Conjugate) detects endogenous levels of total CHOP protein. Monoclonal antibody is produced by immunizing animals with a synthetic peptide corresponding to the sequence of human CHOP. This Cell Signaling Technology antibody is conjugated to Alexa Fluor® 647 fluorescent dye and tested in-house for direct flow cytometric analysis in human cells. This antibody is expected to exhibit the same species cross-reactivity as the unconjugated CHOP (L63F7) Mouse mAb #2895. CHOP was identified as a C/EBP-homologous protein that inhibits C/EBP and LAP in a dominant-negative manner (1). CHOP expression is induced by certain cellular stresses including starvation and the induced CHOP suppresses cell cycle progression from G1 to S phase (2). Later it was shown that, during ER stress, the level of CHOP expression is elevated and CHOP functions to mediate programmed cell death (3). Studies also found that CHOP mediates the activation of GADD34 and Ero1-Lα expression during ER stress. GADD34 in turn dephosphorylates phospho-Ser51 of eIF2α thereby stimulating protein synthesis. Ero1-Lα promotes oxidative stress inside the endoplasmic reticulum (ER) (4). The role of CHOP in the programmed cell death of ER-stressed cells is correlated with its role promoting protein synthesis and oxidative stress inside the ER (4). Ron, D. and Habener, J.F. (1992) Genes Dev 6, 439-53. Barone, M.V. et al. (1994) Genes Dev 8, 453-64. Zinszner, H. et al. (1998) Genes Dev 12, 982-95. Marciniak, S.J. et al. (2004) Genes Dev 18, 3066-77.